As part of my job I am required to travel around quite a bit. 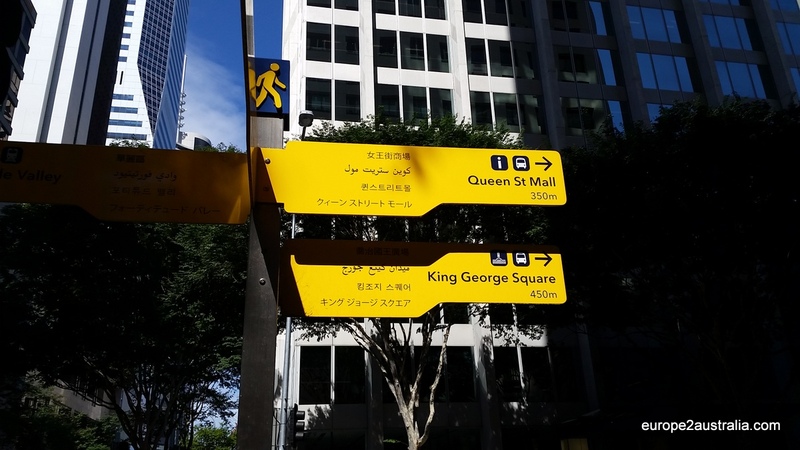 The latest place I got to visit was Brisbane. Here are a few impressions. First of all, the weather is quite different. Only a two-hour flight from Melbourne, it is a completely different climate. Where in Melbourne we a struggling to get the house warm enough so we can take off the winter jackets while being inside, there it is t-shirts and shorts. Even in the middle of winter it’s 25 degrees outside. And, if the locals are to be believed, this will stay more or less the same throughout the year. Not fair! It was the middle of winter when this picture was taken. Notice the distinct absence of anything a European would consider winter clothing. The only downside is the humidity, which can be quite overwhelming. 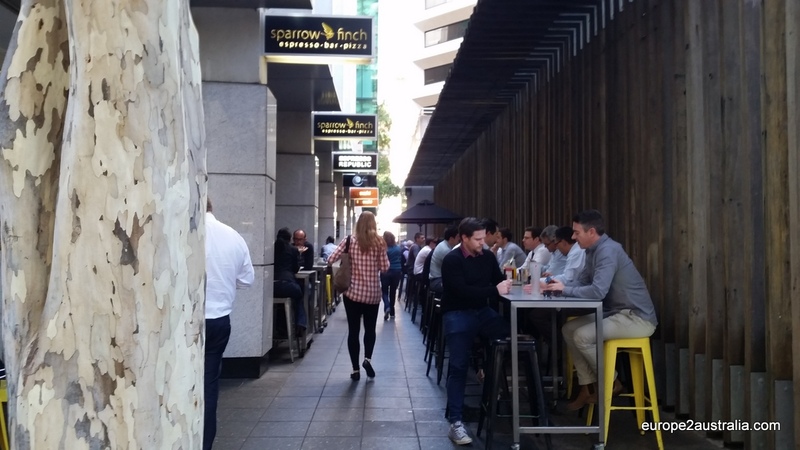 But this difference in climate also means that the outdoor culture, already widely spread in Melbourne, is even more pronounced in Brisbane. When I go out to lunch, the streets are lined with small restaurants and coffee shops (no, not the Dutch variety; the actual coffee-selling-kind), all with their tables and chairs on the sidewalk. And all of them are filled with people. Outside lunch is quite the norm here. And tasty, too. As remarked earlier, the lunch culture is quite pronounced here. It is quite normal for my colleagues to go out for 45 minutes to an hour for some extended food and coffee. It’s almost like Spain or France in that regard. – Well, except for the drinking. While you might have a wine with lunch in the European countries, this is not done here. Not only that it is socially “not done”, but you run the real risk of being tested for drugs and alcohol during your work day and will suffer severe penalties of you are caught with anything in your bloodstream that shouldn’t be there. Multi-language street signs are not that uncommon in Europe, but this one is pretty special. What is also more pronounced here than in Melbourne is the focus on tourism. While (according to Wikipedia) it is “only” the third most popular international tourism destination, after Sydney and Melbourne, it serves as a gateway to the Sunshine Coast and the Gold Coast regions, both popular, national tourist destinations. Signs and maps around the city make it easy for non-residents to find their way around, and everywhere there are flyers and information leaflets. Not to mention a beautiful inner city mall strip. 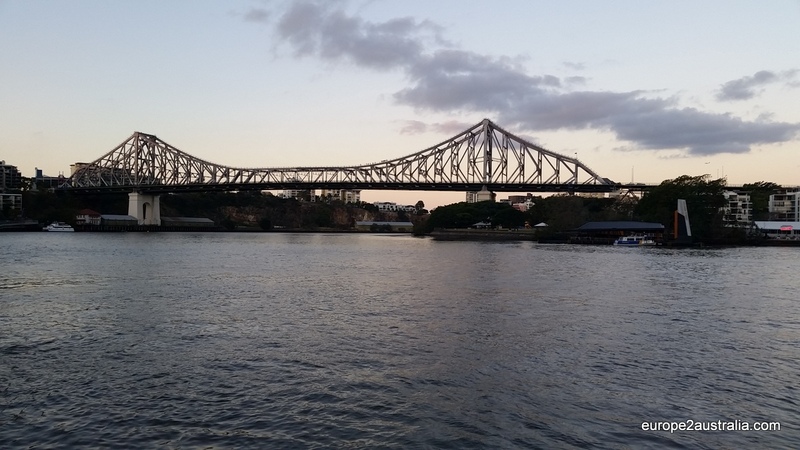 Story Bridge is one of several spanning the river, but certainly one of the most impressive. 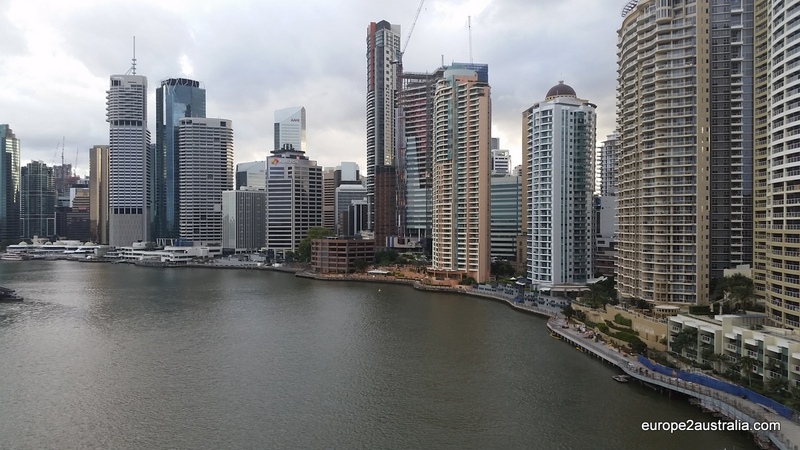 View of the central district and waterfront from Story Bridge. 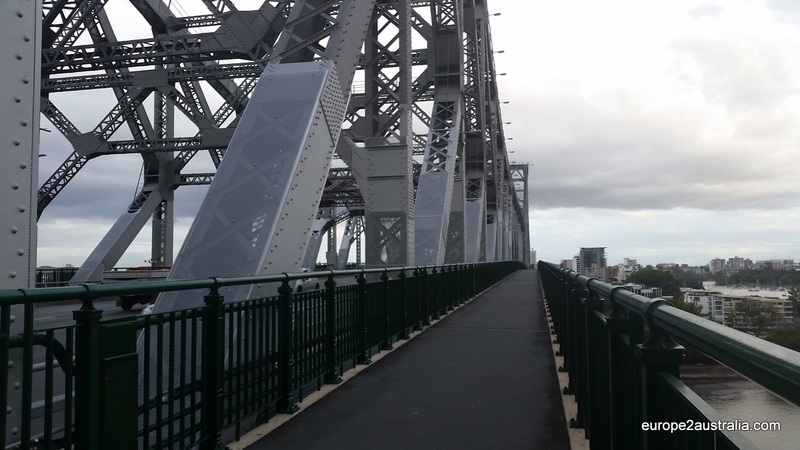 Running across Story Bridge on a 6km loop along the river. Having been in the city center for most of my stay, I didn’t really feel the immensity of the surrounding city and suburbs. It much more feels like a small(ish) city rather than then 3.2 million people sprawl that it is. 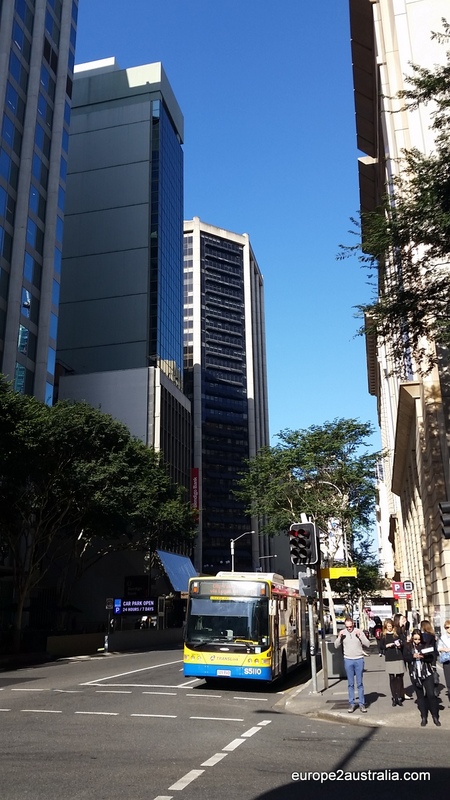 All in all, Brisbane is a very nice place to be. Von Brisbane haben wir nicht viel mitbekommen. Zwar eine Nacht in einem Hotel in einem winzigen Zimmer ohne Fenster und einem Feuerwerk vorher. Dann aber am nächsten Morgen Abholen unseres Campervans und ab nach Norden. Vorher noch mit der S-Bahn zu Apollo Autoverleih. An deren Fahrtweise Du, Oliver, gerade mitarbeitest? Wie war denn nun die Entscheidung für die Mucki-Bude, Willemijn? Bitte schöne Bilder von schönen Menschen!